November 6th is a date of opposing qualities, when life forces have a chance to blossom and the nature within one individual awakens. It is a time of mature contacts and respectful bonds that find enough tact and tenderness to reach middle grounds and satisfy everyone involved. Instincts shouldn’t be cast aside at this time, and it is important that anger and aggression are accepted just as any other emotion in life, so that one can evolve within supportive and healthy personal boundaries. 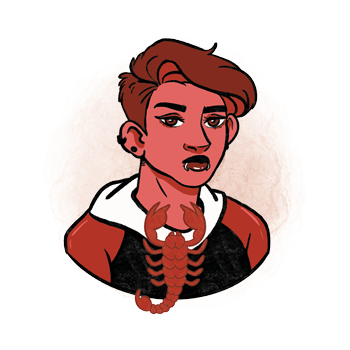 While Venus balances out needs of two Suns, two authorities, and two role models in lives of individuals born on November 6th, they might forget to attend to their instinctive needs and their core of personality. The important thing here is to not get detached from first impulse, from physical needs and one's sexuality, so that true balance can be found within instead of simply serving relationships to merge different attitudes. Their focus should constantly stay tuned to their inner world before they jump out to help others or heal wounds of those around them. Their own wounds need to be cared for first. As soon as their priorities are set on themselves, they become proactive and find the power to make their life satisfying and fulfilling on numerous planes. We can see that these symbols connect the dots through practical approaches, and while we might expect this from little Mercury, it seems like Venus has a task here to point out the connections and relationships among numerous details, people and circumstances. People born on this date feel the need to see the bigger picture through their emotional reactivity to the outer world. They need to connect the dots, connect with others, and create relationships that are based on a solid foundation of individuality and independence. The purpose in lives of those born on the 6th of November is found in the symbolism of Mars, which is not an unusual state for Scorpio representatives but points out the importance of embracing inner oppositions and "negative" emotions in a colorful and positive tone. Their task is to love their anger, let the steam out, work on their material reality and care for their body. During the course of their life, they tend to discover the benefits of healthy routines and physical activity, as they boost their energy to fit their own purpose in life instead of trying to find it in relationships they form. Sexuality plays a large part of each romance people born on November 6th commit to. Their world of relating is mature, often colorful and filled with joy, but their common sense might distract them from instinctive needs that are meant to give a foundation to any lasting bond they make. Ego battles take away a lot of their strength and it is important that they separate their own energy from that of their partner so they can function in mutual respect instead of intertwining in shared topics and hurting each other by putting responsibility or guilt where it doesn’t belong. Their love life will blossom when they find grounding and independence in both themselves and their partner. They need separate banking accounts, agreements on practical issues that flow with ease, and someone to understand that shared love life shouldn’t get entangled with inner issues that are painful and coming from different backgrounds, upbringing and education. They need to feel protected and protect their loved one, secure and safe in a relationship where anything can be spoken of without shame or loss of focus on shared priorities and goals. A person born on November 6th carries a talent to create something special, and their inspiration comes from their deep emotional world. This makes them excellent artists, painters and singers, but also gives them the power to understand how relationships of others function and what needs to be done in order for problems in relating to get fixed. Typically, they develop a love for physical efforts and working routines that require strength and endurance, initiative and constant innovation, and shouldn’t get stuck in a job just for a high position or status if they don’t love it. A very good choice of stone for those born on the 6th of November is alunite, also called angel wing. It is known to boost creativity but is mostly effective in the search for true balance within oneself, or in their surroundings. Its energy is stabilizing, and it will provide the necessary grounding to these individuals, while keeping them in touch with their creative power and the core of inspiration that might be asleep at certain phases of life. By providing balance of yin and yang energies, it improves one's overall physical condition and helps with health issues that might arise, strengthening their immunity and pointing out the imbalance in their daily routine that tires their physiology out. A Scorpio born on November 6th will love a work of art for their birthday, and anything musical, joyful and colorful will boost their spirit and make them feel alive. They enjoy presents that are natural and beautiful, plants in pots, flowery motives that aren’t too expressive but rather natural toned and flowing. You can choose a piece of clothing that is in touch with their independent and brave spirit, as well as anything to support talents they have a hard time expressing around other people. 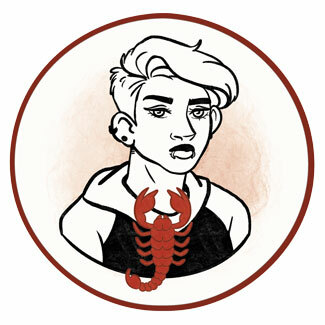 Creative, loving and tactful, they are the mellow, emotional side to the Sun sign of Scorpio and are mostly recognized for their warmth and ability to separate unnecessary things from actual priorities and relationships that are important in their life and their surroundings. Before they turn to themselves and their own inner world, their focus on others could lead to battles for supremacy and disrespect, or simply make them weaker than they actually are. Victimized or aggressive, they need to get their anger and hostility out to be productive and as joyful as they are made to be. In 1946 Sally Field was born, an Academy Award winner, an actress and director, known for her roles in Forrest Gump, Lincoln and others. In her 2018 memoire, she alleged that her stepfather sexually abused her during childhood. In 1957 Lori Singer was born, an American actress, best recognized for her female lead role in 1984 feature film Footloose. Apart from her acting career, she is a Julliard-trained cellist who performed solo at Carnegie Hall. In 1970 Ethan Hawke was born, an American actor, screenwriter and director, who rose to fame starring in the movie Reality Bites. Aspiring to become a writer, he enrolled in New York University twice and dropped out both times to pursue acting. 1869 – The first official intercollegiate American football game is held in New Brunswick. 1944 – The first time that plutonium is produced at the Hanford Atomic Facility. 1945 – Elizabeth Bentley (born on January 1st) turns herself in to the FBI, confesses she had been spying for the Soviet Union, exposing two networks of spies. 1947 – The debut of the longest running television program in history, Meet the Press. 1965 – A program to airlift Cubans who wish to go to the United States from Cuba is formally agreed on. 1971 – Underground testing of the largest U. S. hydrogen bomb.